1. What is the difference between your wall murals and backlit scenes? 2. Is it possible to place Religious Images on exterior windows? 3. Why should I choose Religious Images over stained glass? 4. What are "painted look" and "stained glass look" designs? 5. How many pieces will there be? 6. I have a need for a wide shaped image, will any of your designs work in those proportions? 7. Do you produce custom work? 8. Can you give me a price? 9. How long does it take to get our order from you? 10. Can we see what a design would look like in our church before we order? 1. What is the difference between your Wall murals and backlit scenes? Our wall murals are UV / water resistant. They are available on either a banner or canvas material. They come shipped in a roll. They are for mounting directly to your wall with either commercial wallpaper paste or staples. 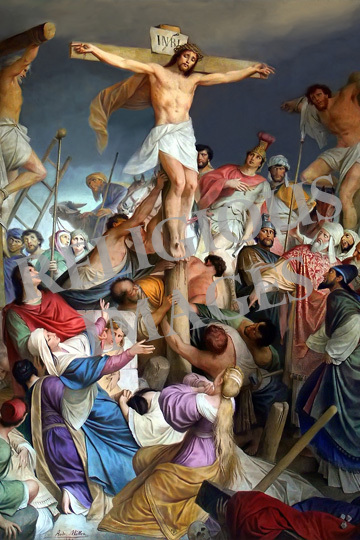 Backlit Religious Images: are mounted to 1/4" thick sheet Lexan hard plastic. They're durable, and UV resistant. Backlit scenes are displayed either in a fluorescent lit shadow box or hung on a rolling track that allows the image to move freely from side to side or front to back. These are for church baptisteries that dont have exterior windows. 2. Is it possible to place these images in exterior windows? For jobs needing exterior windows, we now offer any of our designs in our Illuminado Window film, this product is specifically designed for exterior windows, is inexpensive, and is beautiful. It looks like stained glass and offers UV protection and will save you money on utilities costs. 3. Why should I choose Religious Images over real stained glass? 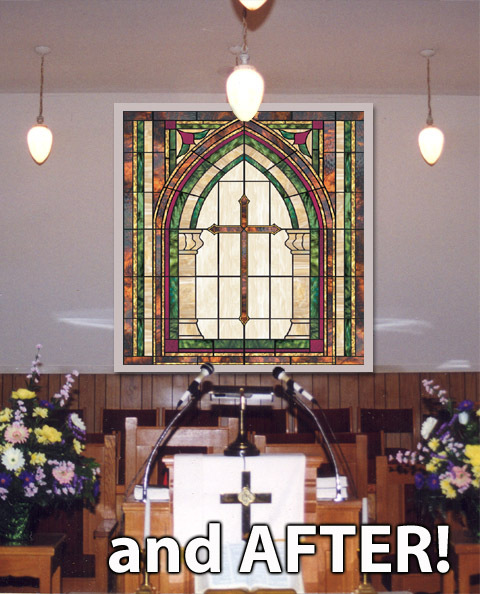 Religious Images gives you the authentic look of stained glass without the cost. Religious Images are a lot more durable too. 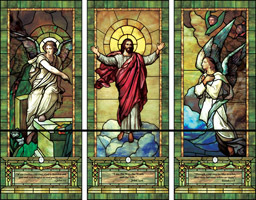 Comparable images in stained glass may cost anywhere from 5 to 10 times the cost of one of our Religious Images. The material we mount the backlit scenes on, Lexan, is shatterproof. 4. What are "painted look" and "stained glass look" designs? 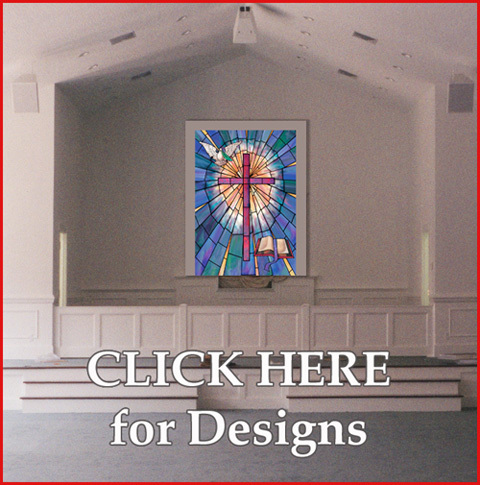 Religious Images offers two type of designs on its website: traditional stained glass looking designs and designs with a painted look. 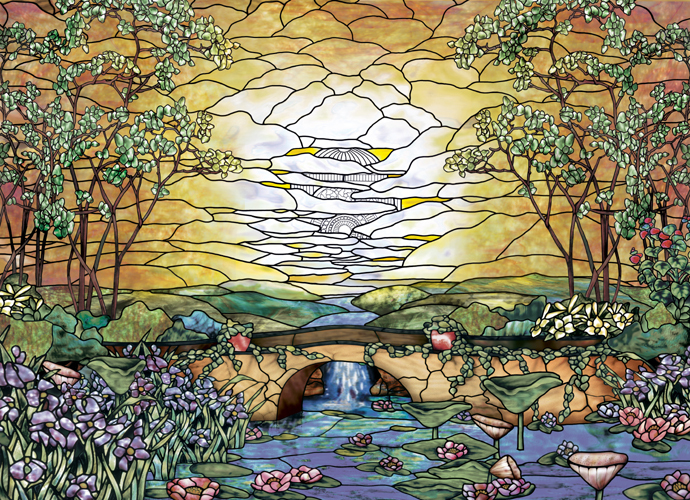 Most Stained Glass designs are available in wide and tall versions and can be conformed to your proportions. To see if your design is available in more than one size or shape, click the corresponding design, a large window will come up showing the variations available. Painted Designs however, can only be done close to the proportions seen here on our website. The painted designs are also available as frameable canvas artwork, as explained below. 5. How many pieces will there be? There are situations when our images need to be split into pieces due to size restrictions on materials used. ANY size is possible. We've had images over 30 feet long. On backlit scenes we supply a bronze aluminum "H" bar needed to connect and support the pieces (See diagram). This bar doesn't detract from the beauty of the scene and when designing, we ensure NO bars will be in the center of the design. Vinyl murals come with extra few inches of overlap on each piece. When installed these seams are barely visible up close and invisible from a distance. 6. I have a need for a wide shaped image, will any of your designs work in a wide shape? It depends, most of the "stained glass look" designs (examples show on left) can be done in either tall, wide or square proportions. Most of stained glass look designs pictured here already have wide versions available that can be seen by simply clicking on the design choice (updated pictures coming soon) and can easily be adjusted. 7. Do you produce custom work? Certainly, we pride ourselves on accommodating the most discriminating customers. 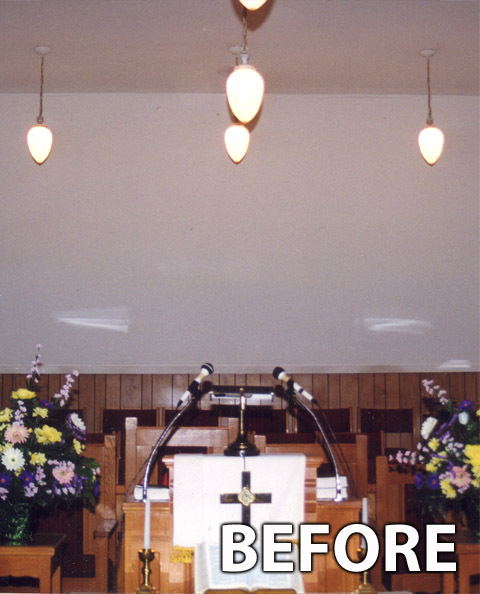 We work diligently with each church in regards to custom designs, logos and colors if that is desired. Customizing fees may apply depending on the job. All we ask is if we are reproducing something (such as a church logo) for you in a large scale, to supply us with as high a quality of artwork as possible, any time spent cleaning your artwork for production is subject to an artist fee. 8. Can you give me a price? How long does it take to get our order from you? Most orders take around 2 weeks from the time we receive payment to the time we ship it out to you, though in many instances we can get you an order quicker. Custom designs may take longer depending on the job, call us for details. Can we see what a design would look like in our church before we order? Simply send us your photos via email or regular mail and our art staff will put together a mock-up of your church with your design choice inserted into your baptistery area and email it back to you. 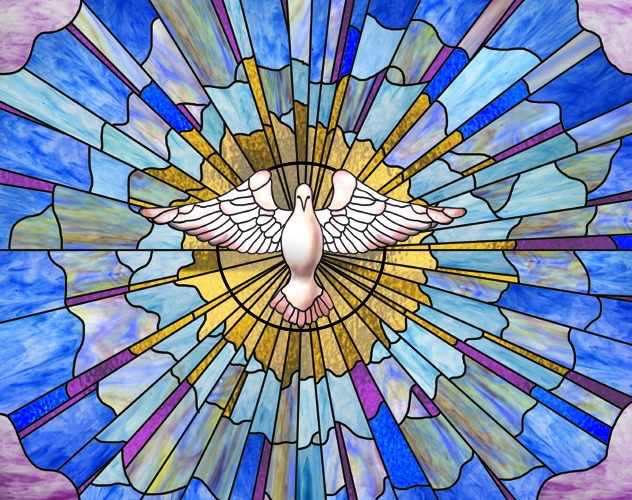 Having trouble choosing between the Fountain of Life and The Radiant Dove? Our service makes it easy to choose the right scene for your setting. We offer this valuable proposal service for FREE... We are positive that you will love the difference that a new baptistery scene from Religious Images will make in your sanctuary! No order will be produced without first sending you a mock up of the design to be produced via email for approval.